Five on Friday! – It Works For Bobbi! Published on November 9, 2007 August 9, 2016 by Bobbi-Jo G.
1. I had the best time on Wednesday with my buddy Myril. We got together mostly so I could show her the basics of creating a digital scrapbook page using Elements 5.0. I was amazed by how quickly she caught on – especially to the layers stuff. It’s not an easy learning curve for most. She made an awesome page, too! 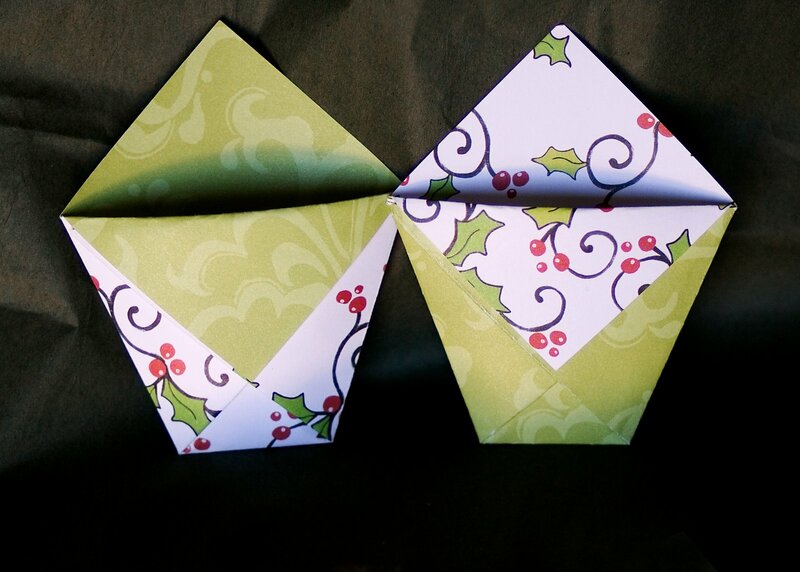 I also brought along some double sided patterned paper to fold these little candy holders for our up coming Christmas Enrichment night (which the hubbys are invited to). I saw these on Heather’s blog and thought they would look so cute set on each place setting, filled with a little baggie of M&Ms or another sweet treat. These are smaller than Heather’s (I made them with 6X6 squares) but they are big enough to have a small baggie of sweets. Myril and I folded about 56 of these. We decided that we were hungry, so we went to Boston Pizza for a late-night appetizer. Myril picked the Spinach and Artichoke dip – divine!! Myril and I had so much fun visiting and laughing over the “good old days” when we were best buds as teenagers. 2. I saw yet another commercial for a brand new toothpaste. I said to my hubby “There is always a NEW and IMPROVED toothpaste! When are they going to reach the pinnacle of what toothpaste can do? ” My hubby snickered and says, in his best announcer voice “New and improved toothpaste – It cleans, freshens, whitens, and does your taxes while you sleep!” Now THAT would be a great toothpaste! 3. I love that commercial for Benylin cough/cold medicine. You know, the one that says “The world can go on without you for a day. Take a Benylin day”. Okay, HOW does this work for a stay at home mother of 4? I’d love to see the medicine that gets the kids up, makes breakfast, helps the kids get ready and off to school, changes diapers, makes bottles, sweeps the cheerios off the floor, does the laundry, dusts, makes lunch, vaccums, makes dinner, washes the dishes, AND cures your cough and cold in one day. I would pay a lot of money for that. I’ve said it before – Moms don’t get sick days! 4. My three year old found a dime, a nickel, and two pennies on the ground. She picked them up and says to me “Mom – I got 17!” WHA??? Did you just add money? Was that just a coincidence? Maybe we’ve got an accountant in the making. 5. I found this awesome blog – you should check it out: Stampin when I can. She keeps a running list of blogs that offer blog candy, tutorials, challenges, and just all around great blogs. So fun! I found a bunch of digital scrapbooking freebies and some neat tutorials on there. One great tutorial was on how to print 12X12 layouts in the 6X6 format (you can find that tutorial HERE . So neat! That’s funny, I was just going to email you Emily’s blog link listed in your #5!Next time I’m at Costco I’ll let you know. I have to go there soon & I have a card! Hey BobbiI have good news for you…I think, I decided to do a little investigating…so I went to http://www.costco.ca & than in the bottom right hand corner there is a Photo Link, I went there signed up an acct, uploaded a pic & than I searced to see what kind of size of pics I can get:The following warehouse locations offer 11×14, 11×16.5 and 12×18 enlargements.AlbertaCalgary2853 32nd St Ne99 Heritage Gate Se11588 Sarcee TrailSo YES we do! Exciting.So if you want you can always upload to them & have them ready & I can pick them up for you or you can come with me whenever you need to. If you can’t open an acct because you don’t have a card just let me upload for you to get them printed. and they are $2.99 for the 12×18 ready in 24 hours. OK, I’ll stop now! Thanks for checking into it for me, Michelle. I may just take you up on it in the near future. Too bad I didn’t know about this a week ago when I ordered 26 layouts from 2Peas! Yikes, that’s alot of layouts to print, how is their pricing? Did you do them all individually? Their 12X12 layouts are $3.49 US – so it was actually cheaper in Canadian funds, plus shipping. They do each layout separately. ACtually, I have 4 sheets I need to print out (12X18) and wonder if you’d be willing (Christmas project). Let me know, Michelle! Thanks again!